Medical Insurance is a mandatory for every expatriate and his family in Saudi Arabia, Without medical insurance it is not possible to renew Iqama or to process exit re entry visa for expatriates. 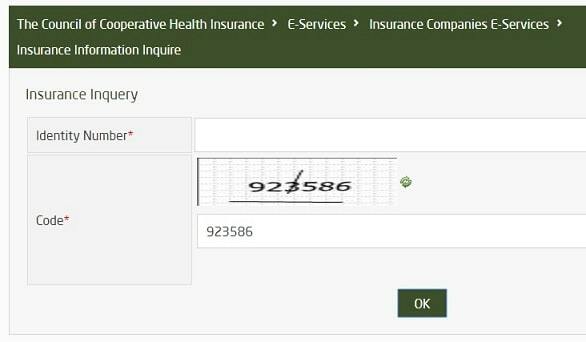 The Council of Cooperative Health Insurance provided a service to check your health insurance or medical insurance in Saudi Arabia by entering your Iqama number or by entering your border number instead of Iqama number. Medical Insurance must be updated in MOI health Insurance systems, To check your online medical insurance details in MOI Systems you can follow this article "Check Medical Insurance validity through MOI". 1. Visit the official website of "The Coucil of Cooperative Health Insurance", Select your language as 'ENGLISH', Choose 'BUSINESS OWNERS' from the available options, Now on left side you can see a tab 'INQUIRE ABOUT HEALTH INSURANCE', click on it. 2. Enter your 'Identity Number' and Image code as visible just above the textbox of 'code'. - If you have Iqama number then you can enter your Iqama number in the textbox of 'Identity Number', If you do not Iqama then you can enter your 'Border Number', Border number is a 10 digit number which is alotted by immigration officer and written in Arabic on your passport's entry page while you are entering into Saudi Arabia first time. 3. Once you entered your Identity number (Iqama number or border number) and image code, You can click on 'OK' button. It will redirect you to a page, where you can see your details. 4. Details will have a information of your Medical Insurance company name, Your Identity Number, Policy Number, Insurance Expire Date in Hijri, Insurance Expire Date in Gregorian, Upload Date in Hijri and Upload Date in Gregorian. 5. If you do not have Medical Insurance or Health Insurance, You can see the message "You don't have Insurance" as shown in below image.